2017 is coming to a close. The end of the year is a great time for reflection for us here at MWI. It’s an opportunity to look back on what marketing activities were winners and which ones were duds. 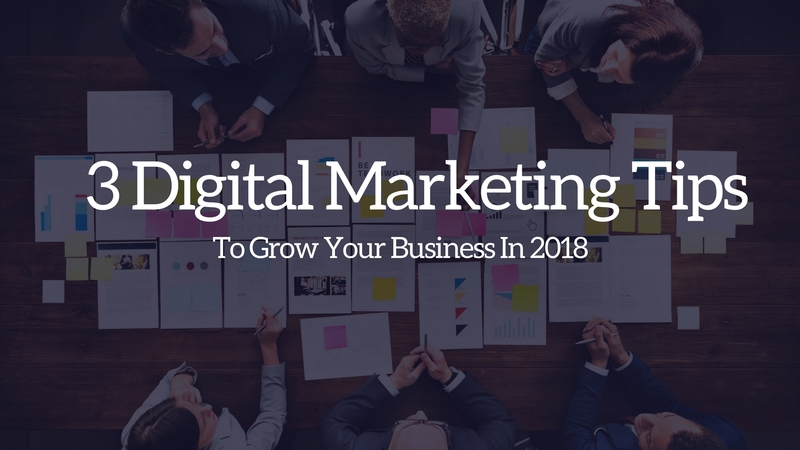 As we’ve looked back on our past year in digital marketing, we’ve identified a few marketing tips that have contributed to huge growth for our clients and for MWI. In today’s digital marketing landscape there are dozens, if not hundreds, of tactics available for digital marketers to try. It’s easy to get distracted by all the options out there, spreading yourself thin by dabbling in all of them. However, for most businesses, the primary drivers of success in their marketing comes from one or a few tactics. For MWI, our biggest driver of early growth was content marketing, particularly our CEO, Josh Steimle, getting published in top news outlets like Forbes, Entrepreneur, Inc., and Mashable. In fact, 5 million dollars of revenue can be traced just to our content marketing alone. As we’ve continued to broaden and deepen our content marketing efforts, those returns have only increased. That’s why we onboard each client with a discovery process that helps us find out what their strengths are, so we can double down on them. Find out what individual tactics or content types are performing the best, and simply do more of them. If your Instagram account is growing quickly and is leading to a lot of conversions, invest more of your marketing budget into it. If your cold emails have high response rates, increase your budget for email prospecting and send more emails. Of course, you don’t want to be afraid of experimenting with new marketing techniques. But don’t fall into the trap of starving your strongest performers by trying to feed your weakest ones. As businesses grow, they often get more complex, with increased workloads and time demands for those in management. Marketing departments are no exception. As the complexity of marketing grows with the size of a company, businesses often resort to hiring more staff to keep up. But even with more staff, it’s easy for the performance of marketing campaigns to slip. The answer is to get organized by planning out your sales funnel. A good sales funnel begins with your target audience in mind. It plots the course your ideal customers will take, from the first moment they engage with your brand, to engagement through your various marketing channels, all the way to conversion. To create visual representations of all the steps, we use www.draw.io, but almost any sketching software will do the trick. Another benefit of planning out your sales funnel is that it enables you to smoothly incorporate automation into your marketing. 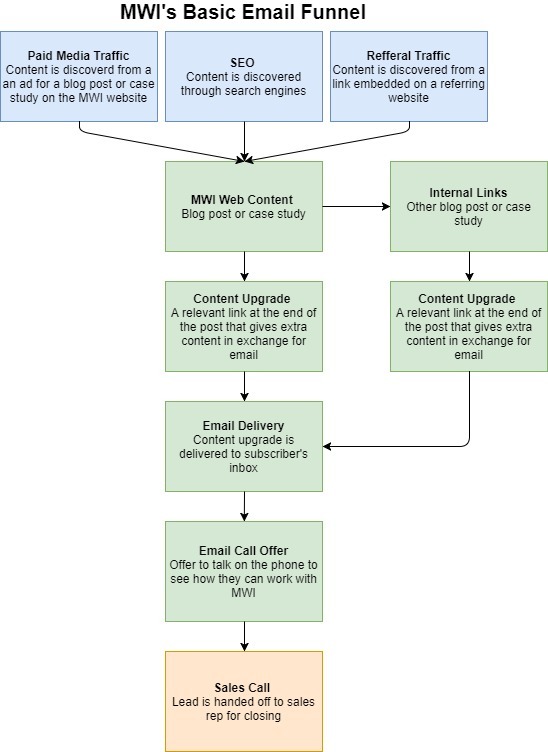 In the above example, we use MailChimp to automate all the steps between writing the content and making the sales call. Email is one of the easiest things to automate in a sales funnel, but social media is also a good place to add automation to your funnel. 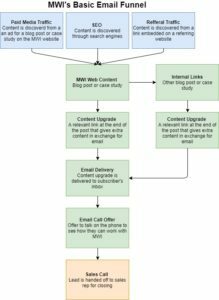 To learn more about how to build a sales funnel for your business, check out this guide we wrote on the subject. When clients come to us, they often tell us that they’ve tried SEO, PPC, or content marketing, but it didn’t work out for them. Although it’s true that every digital marketing tactic won’t work for every business, the problem usually isn’t their choice of strategy. The main problem that marketers encounter when using any given tactic is that they either haven’t devoted enough time to it or they haven’t applied the tactic with the right scope. For example, a great PPC campaign can deliver lots of traffic to your website, but if your landing page isn’t optimized for that traffic, you may not get as many conversions as you had hoped. An SEO strategy that includes regular blogging and backlink building will definitely increase traffic and search engine rankings. But without optimizing your website for SEO and resolving any technical SEO problems, you’re leaving a lot of potential gains on the table. That’s our take on what businesses can do to grow through digital marketing next year. What’s yours? Let us know in the comments below!